White Chinese are pure white in color and are several pounds smaller than the Toulouse. They are hardy, the best laying of all the geese and their eggs hatch well. White Chinese have a knob on top of their heads. 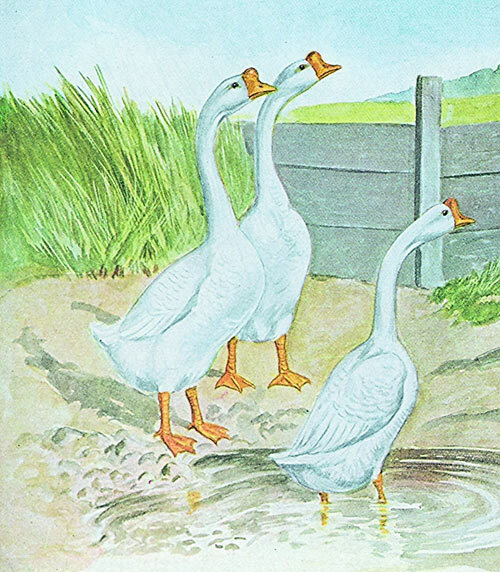 These geese are very beautiful and make good watch dogs. They will average 10-15 lbs. How many eggs on average does the White Chinese lay? And does the Brown Chinese lay the same amount? White Chinese geese lay an estimated average of 45-55 eggs/yr. Brown Chinese geese lay an estimated average of 30-45 eggs/yr. How many white Chinese geese is the minimum order? You can order as few as 2 baby geese. That means the birds are not sexed. They are sent "as hatched" and are not seen by the sexers. If a person spends over a certain amount of mouney on geese and ducks, would you have free shipping and handling? Sorry, we do not offer free shipping on any poultry.